The Society proudly co-ordinates a number of programs, some of which are listed below. For further information on these programs, including resources available and how to implement the programs, please contact the Society program co-ordinator (refer to the Contact Us.page, or click here to enquire. Love-2-Swim™ / Swim & Survive™ : Love 2 Swim is the re-branding of the highly successful Swim and Survive Program that the Royal Life Saving Society has successfully delivered as a Nationally Accredited Swimming and Water Safety Program. This program has been educating 5-14 year olds for over 20 years. Since 1982 it is estimated that over 10 million Australians have participated in the Swim and Survive program. It aims to reduce the number of drowning deaths by ensuring that children have a sound knowledge of safety when in, on and around the water, including skills in swimming, personal survival and basic rescue. Since programs like Swim and Survive were introduced, there has been a 75% reduction in drowning in the 5-14 years age group. Click here for more information"
Australia wide children attend Swim and Survive lessons through schools, commercial swim schools and government departments. The program aligns itself with the National Water Safety Framework and School Curriculum ensuring that competencies are matched with a child's development. Swim and Survive allows for flexible delivery and can be delivered as a weekly term program or as an intensive holiday program. More than swimming lessons, it's an adventure! Swim and Survive provides a broad, balanced program of swimming, water safety and survival skills in preparation for a lifetime of safe activity in, on or near the water. Swim and Survive caters for children of all abilities. The early levels provide opportunities to build confidence and respect for the water, whilst the upper levels prepare the child for the increased complexity of their relationship with aquatic environments. Bright and colourful certificates reward children for the many developmental steps that they will take in learning to Swim and Survive. Remember that a quality swimming and water safety program should extend throughout the child's schooling. Bronze Medallion™ : The Bronze Medallion and Bronze Rescue strand teaches an understanding of the life saving principles embodied in the four components of water rescue education (judgement, knowledge, skills and fitness). The central component of the Bronze program is the Bronze Medallion which has been operating for over 100 years with many Australians undertaking the program since commencement. The Bronze Medallion is considered the pinnacle of life saving qualifications in the community. Life saving skills learnt and developed through the program are highly regarded in the community and may even lead to or enhance the chances of starting a career. Keep Watch™ : Keep Watch is a public education program of the Society aimed at preventing drowning deaths of children under 5 years of age in all aquatic locations. There are 4 main actions of the Keep Watch program that parents and carers of children are encouraged to undertake to prevent children drowning. 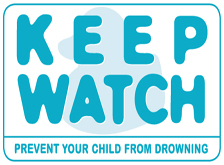 Keep Watch aims to prevent drowning deaths of children under five years of age in all aquatic locations. For nearly 20 years Keep Watch has been educating Australian parents and carers on how to keep their children safe when in, on or around the water. Drowning is one of the leading causes of death in children 0-4 years of age. Between 2002 and 2015, 403 children under the age of five drowned in Australian waterways. 78% of these deaths were the result of falls into water and over half occurred in home swimming pools. The Keep Watch program has four key drowning prevention Actions. These should not be used individually but together to maximise child safety - if one line of defence fails, the other prevention measures will be actively working to prevent your child from drowning. Keep Watch Action - Active Supervision: Active Supervision means focusing all of your attention on your children all of the time, when they are in, on or around the water. Supervision is not an occasional glance while you are busy with other activities, but being in constant visual contact with your child. Depending on your child's age, you may even need to be in the water and within arms' reach at all times. For older children, be ready to enter the water in case of an emergency. Older children too are not equipped to deal with the responsibility of supervising children. It is an adult's job and children of any age should never be burdened with the responsibility. Keep Watch Actions - Water Awareness: Water awareness combines a range of strategies and activities designed to keep your child safe when in, on, or around water. These include water familiarisation, checking for and removing water hazards, setting rules around water and discussing water safety with your child. Water awareness classes, such as Royal Life Saving's Swim and Survive Wonder Program, focus on the gradual introduction of very basic skills for children aged 6 to 36 months like moving in the water, getting the face wet and blowing bubbles. Keep Watch Actions - Resuscitate: A family member is the first on the scene in most emergency situations. In fact many children are alive today because their parents knew how to perform CPR and responded quickly. For this reason alone, Royal Life Saving encourages everyone to learn CPR. Keep Watch has widespread community and industry support. Keep Watch is proudly supported by Protector Aluminium. Grey Medallion™ : The Grey Medallion is a water safety and lifesaving skills program for adults aimed at reducing the drowning rates and encouraging a healthy, independent and active lifestyle. The program endeavours to teach participants a range of personal survival techniques, provide them with skills to deal with an emergency situation, how to improve their supervision of children and to develop confidence and competence to enjoy aquatic exercise and other water-based activities safely. Essential water safety information for a range of aquatic locations and recreational activities is the focus for this module. The prevention of emergencies depends on your understanding of, and ability to apply simple water safety actions. Lifesaving skills are not just for those at the local pool or beach. Everybody should have some essential personal survival techniques and basic rescue skills. You never know when these skills may need to be put into practise either to ensure your own safety or to assist somebody else in trouble. I heard about the Grey Medallion on the radio and I would like to make more enquiries about it. I've just had my 60th birthday and have never forgotten the thrill of receiving my Bronze Medallion at school in 1964! It's still hanging on my wall, as part of a quilt about my life! I just wanted to thank RLSSA for the Grey Medallion training that you gave us. I was able to put that training to good use last Friday at Auburn shopping centre. As I walked in there was a woman who appeared to be having a fit. I was able to assist by helping to get her on the floor and into the recovery position just as we were taught. Someone called Triple Zero and someone ran across the courtyard to the Ambulance Station to get a Paramedic. I felt good as I knew what needed to be done and did not just stand in the crowd and feel useless! Many Thanks. Water Safety : Water Safety tips and resources for teachers, parents and children. Resources are provided for around the home, swimming pool, beach, rivers, lakes, farms, fishing and boating. The resource page also includes links to games and activities. Keep Watch aims to prevent drowning deaths of children under five years of age in all aquatic locations. For over 15 years Keep Watch has been educating Australian parents and carers on how to keep their children safe when in, on or around the water. Drowning is one of the leading causes of death in children 0 to 4 years of age. Between 2002 and 2015, 403 children under the age of five drowned in Australian waterways. 78% of these deaths were the result of falls into water and over half occurred in home swimming pools. The Keep Watch program has four key drowning prevention Actions. These should not be used individually but together to maximise child safety, if one line of defence fails, the other prevention measures will be actively working to prevent your child from drowning. The home pool environment is often a place of fun and enjoyment. However home pools are a location with a high risk of drowning, particularly for children under five years of age. This section includes useful information on a number of different topics to improve safety in and around the home swimming pool. Home Pool SafetyThe home pool environment is often a place of fun and enjoyment. However home pools are a location with a high risk of drowning, particularly for children under five years of age. Download the PoolSafety App and use the checklist to identify a problem, take a photo and email a report. The PoolSafety App recommends actions to make your home pool safer. You can use the report as a record or to seek help to fix the problem. First Aid and CPR (resuscitation) are skills that every parent should learn. Whether for your children, your spouse, your extended family or friends, you may one day be called upon to ,be a lifesaver,. A Royal Life Saving course will give you the essential skills, knowledge and confidence to administer first aid or resuscitation until professional medical help arrives. Your actions could mean the difference between life and death. First Aid and CPR (resuscitation) are skills that every parent should learn. Whether for your children, your spouse, your extended family or friends, you may one day be called upon to ,be a lifesaver,. A Royal Life Saving course will give you the essential skills, knowledge and confidence to administer first aid or resuscitation until professional medical help arrives. Your actions could mean the difference between life and death. Water safety education is a key element in developing water wise children who have the knowledge and understanding of the dangers of aquatic environments and activities. Royal Life Saving has developed a range of entertaining but educational activities for all different age groups and levels. Water safety education is a key element in developing water wise children who have the knowledge and understanding of the dangers of aquatic environments and activities. Royal Life Saving aims to develop a water safety culture through safe behaviour and a positive attitude towards water safety. Children are more likely to participate and be encouraged to learn water safety skills and knowledge whether it is at home, at school or at the local pool through fun and interactive activities. Royal Life Saving has developed a range of entertaining but educational activities for all different age groups and levels. Visit the Kids Zone for interactive games, colouring-in and activities such as find a word, crossword or scrambled words. Visiting your local beach, public swimming pool, river, lake or dam on a hot day can be fun, but its important that you follow these easy to remember rules known as the AquaCode. Water Smart is a water safety education program for the classroom that aims to provide quality teaching resources for teachers, swim teachers and community groups. The Water Smart toolkit contains curriculum materials to teach a unit of work and a guide for the delivery of the Water Smart award. Curriculum materials to teach Water Safety have been developed by Royal Life Saving together with education resource specialists, teachers and water safety instructors. These resources are available in PDF or interactive whiteboard format for teachers to download and teach a unit of water safety. Register your school or organisation on the Swim and Survive website to gain access to the Water Smart educational resources ~ click on the link and complete the form. You will receive a username and password to use to login to the registered schools zone. Once in the registered schools zone, select the school year you are teaching on the left hand navigation to view the unit of water safety documents available to download. It can be conducted in the classroom or playground at schools as there,s no requirement for practical work in the water. The Water Smart Award can be delivered by school teachers, teachers of swimming and water safety or Royal Life Saving instructors or examiners. A guide to delivering the Water Smart Award is available. On successful completion of the Water Smart Award students are presented with a Water Smart certificate as recognition for their achievement. Register your school or organisation on the Swim and Survive website to gain access to the Water Smart educational resources - click on the link and complete the form. Learning to swim is challenging yet very rewarding. It provides opportunities for recreational activities and a healthy lifestyle, but also provides skills that may one day save a life. 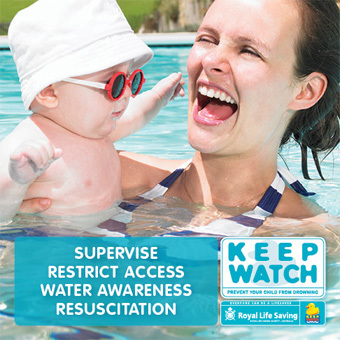 Swim and Survive is Royal Life Saving's national swimming and water safety program. The Swim and Survive program has been teaching Australian children for 30 years in pools, schools and other aquatic locations across the country by qualified swimming and water safety instructors. in addition to a process of developing strong and effective swimming technique. reflect the hopes and aspirations of children and families as they embark on a lifetime of fun and safety in the water. Facts sheets contain key information about important water safety topics. Junior Lifeguard™ : The Junior Lifeguard Program offers a unique aquatic alternative for those who love the water, who want to be challenged and who want more than just swimming lessons. The program provides opportunities for children to keep interested and active in aquatics, especially quick learners and those caught between levels and programs. The program is suitable to be run by Swimming Schools, Public and Private Swimming Pools, Clubs, Schools, or any youth group as a one-off, or ongoing acticity. The Society provides coaching resources (coaching manual, lesson plans, etc) and children undertake the Love-2-Swim series of qualifications, with a pathway into pool life saving sport and competition.